Some Washington hiking areas give you a chance to meander through magnificent old-growth forests and under massive evergreens draped with moss and lichens. Others offer you the opportunity to explore Washington’s coasts, letting you pick your way along gravelly shores littered with beach wood and see precarious sea stacks standing tall just off shore. Cape Alava’s 9.4-mile Ozette Triangle loop in Olympic National Park lets you experience the best of both worlds. I visited Cape Alava for the first time a few weeks ago. I was use to hiking along Washington’s Pacific coastline, having hiked at Ruby and Shi Shi beaches and from the Hoh River outlet up to Rialto Beach. However, Cape Alava maintains a reputation as one of the best coastal hiking areas in Washington and the Pacific Northwest. To say the least, I was excited about this trip, and it did not disappoint. 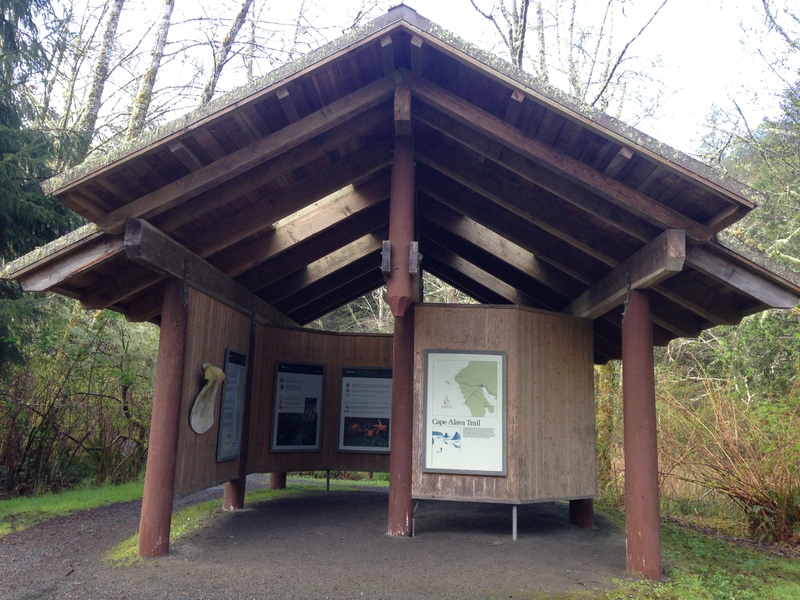 The Ozette Triangle (also known as the Ozette Loop) begins at the northern end of Lake Ozette near the Ozette Ranger Station and Ozette Campground. Park at the trailhead just past the ranger station on the right side of the road. Hikers have the option of taking either the Cape Alava or Sand Point trails to the coast. The coastal section follows the last three miles of the Pacific Northwest National Scenic Trail. This section isn’t so much a trail as it as a hike along the shore. 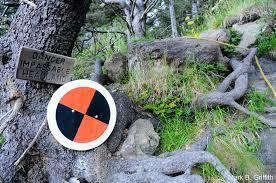 However, at high tide, hikers will need to take two overland trails, identified by black-and-red (often faded red to the point of being white) impassable headlands signs. 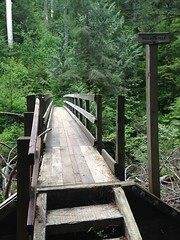 Both the Cape Alava and Sand Point trails are well maintained, and either one will work for the hike out and hike back. 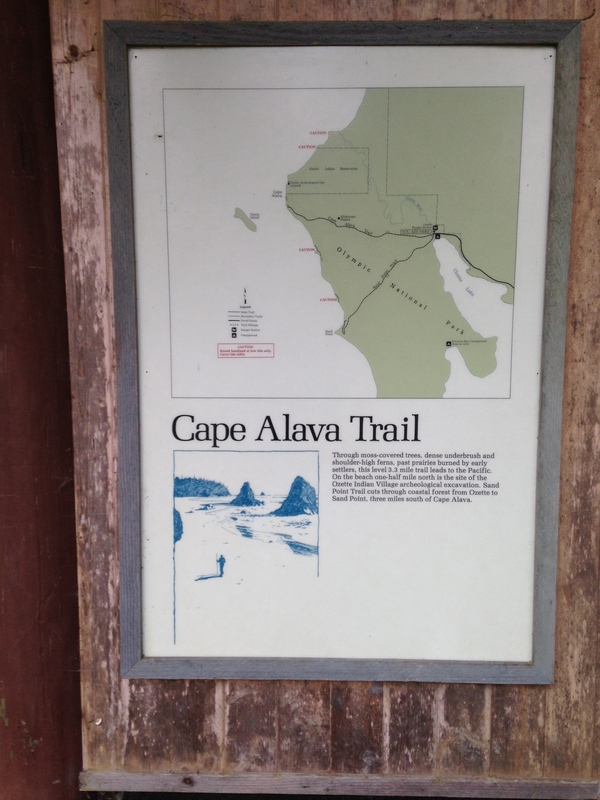 I personally recommend the Cape Alava Trail because it will allow you to rest at and enjoy Sand Point, a scenic rocky outcrop, before heading inland at the end. When I hiked the Triangle with my family, we saw deer grazing on the Sand Point headland. Taken from Cape Alava: Ozette Island (far left) and Tskawahyah Island (far right) in the background. 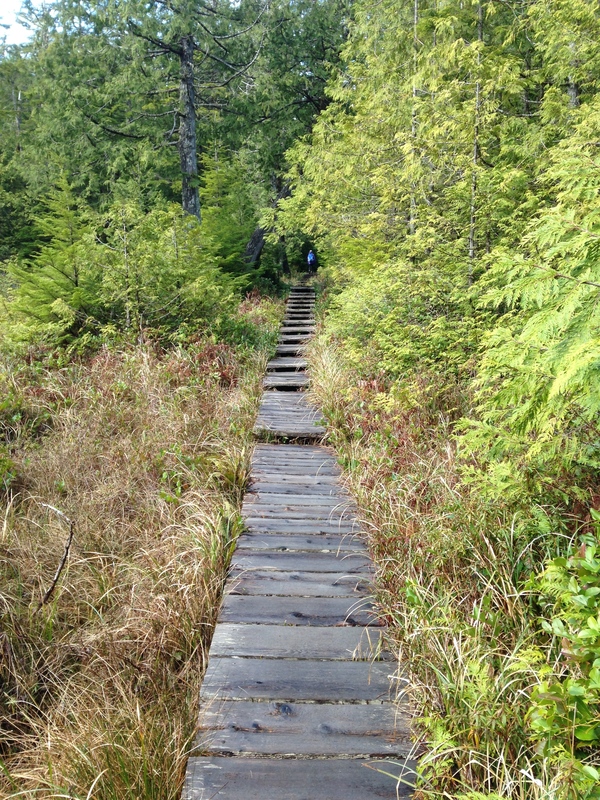 = The Ozette Triangle is almost an entirely flat hike. 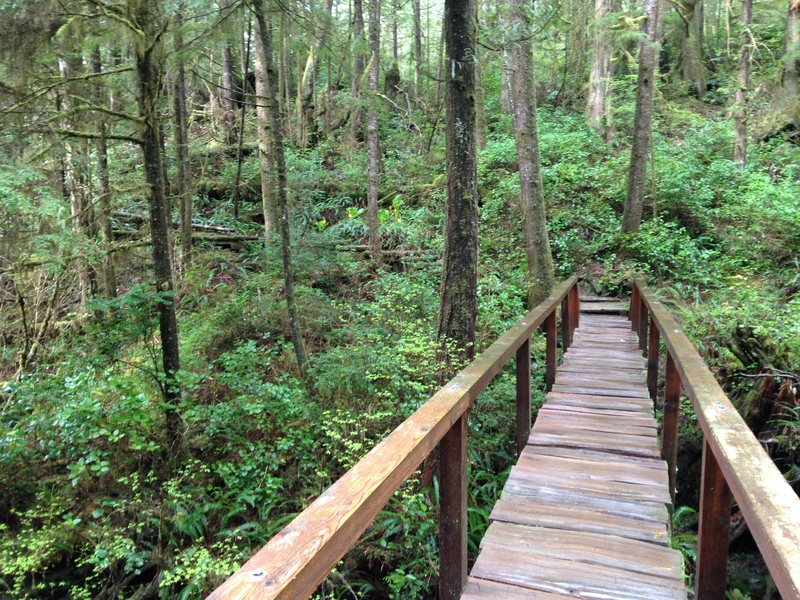 The Cape Alava and Sand Point trails consist mainly of boardwalks. When I was there, crews were in the process of fixing up the boardwalks on the Sand Point Trail. 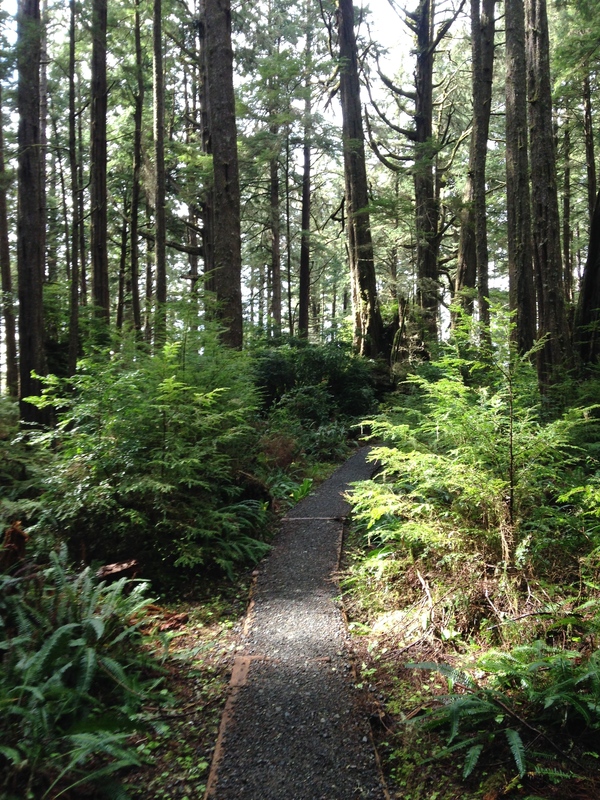 Both trails are well maintained and easy to traverse, taking hikers through old-growth forests and coastal marshlands. If you’re hiking with kids, and they are up for a good, long day hike, I highly recommend the Ozette Triangle. The flatness of the trails make it an easy hike, and the kids will enjoy the chance to explore tidal pools and beach debris. = Cape Alava and Sand Point trails consist mainly of boardwalks and these boardwalks are, for the most part, in great shape. The trails consist of compacted gravel in the sections without boardwalks. The section along the coast is not really maintained since there doesn’t really exist a trail there. This section severely lacks in signage. Bring a map and learn to recognize the impassable headlands markers (shown below). 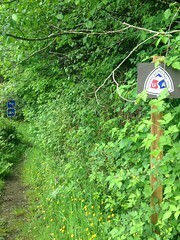 These colored signs will also mark trailheads, and sometimes campsites; you will not find an actual sign with text until hiking inland at these markers. = Cape Alava is about as rural as it gets on the Olympic Peninsula short of a visit to Neah Bay and Cape Flattery. That said, there were plenty of hikers and campers there when we visited in mid April. If you plan to camp at Lake Ozette, establish a backup plan. I saw at least one private campground just outside the park here. If you plan to backpack in and camp at one of the popular wilderness sites between Cape Alava and Sand Point, you may need to make reservations depending on what time of year you visit. Ozette Triangle and car and wilderness campgrounds there are open year-round. 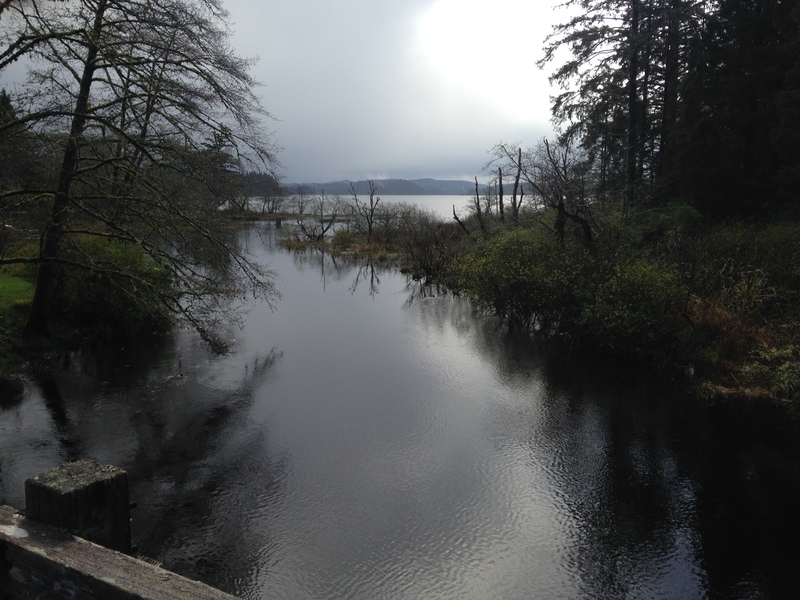 Taken from Trailhead: Ozette River and Lake Ozette in the background. 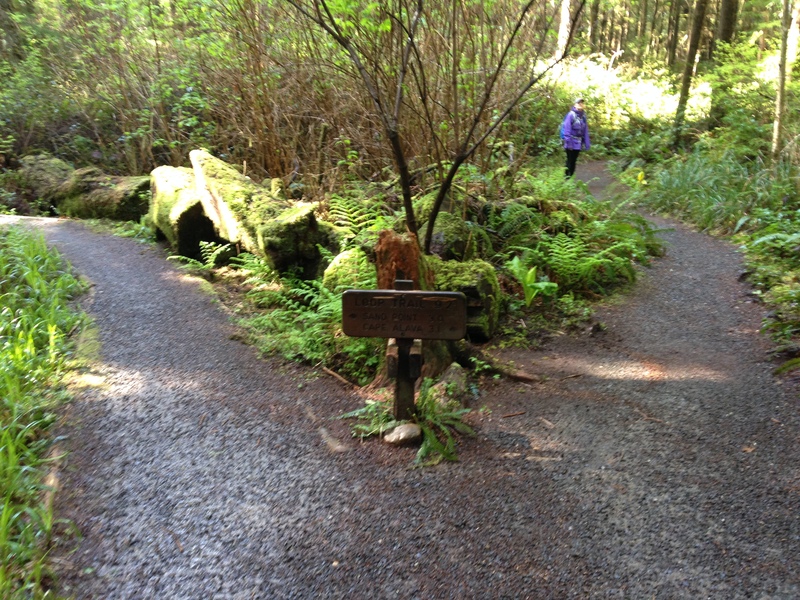 Trail divides into Cape Alava (right) and Sand Point (left) trails. Where: If coming from the South Sound area and Route 5, the quickest way to Cape Alava will likely be taking routes 8 and 12 to Aberdeen, and then taking Route 101 up along the Pacific Coast. If coming from Tacoma and areas north of there, it will be faster to drive up the east side of the Olympic Peninsula and through Port Angeles. Either way, both routes take about the same length of time. When to Go: The weather on the west side of the Olympic Peninsula changes rapidly. 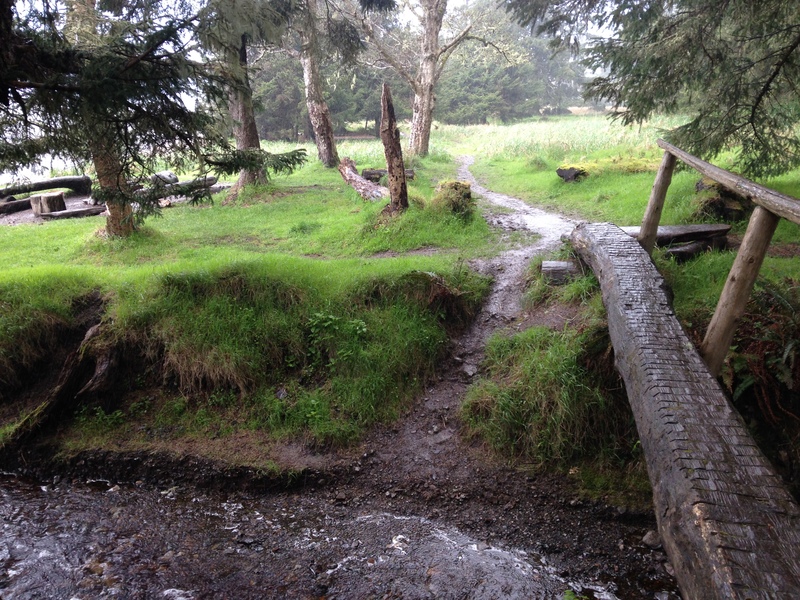 When I visited Cape Alava and hiked the Ozette Triangle, it rained as my family and I hiked to the coast, was completely sunny and clear as we made our ways down the coast, and then hailed a little as we headed back to the trailhead at Lake Ozette. Best practice: prepare for rain no matter what. It frequently rains or drizzles this close to the Pacific coast anyways. If you plan to camp, you do not need reservations to camp at Ozette Lake. If you plan to camp at one of the many wilderness sites along the coast, or even if you just plan to hike the Ozette Triangle, read this page on the area’s rules and regulations. Trail Info: Bring sturdy hiking boots to hike along the shoreline. The rocks are often covered by slippery algae at low tide. Otherwise this hike is pretty straightforward. Once you reach the coast (on either the Cape Alava or Sand Point trails) head north or south along the beach, depending on which trail you reached the coast by. If you want to make this hike a little longer, try hiking up the coast from the Cape Alava Trail to the S. Ozette River outlet (only passable at low tide) or hike south, below Sand Point, to the 2-mile wilderness trail to Lake Ozette’s Ericson Bay. Look for an impassable headlands sign that marks the Ericson Bay Trail trailhead. 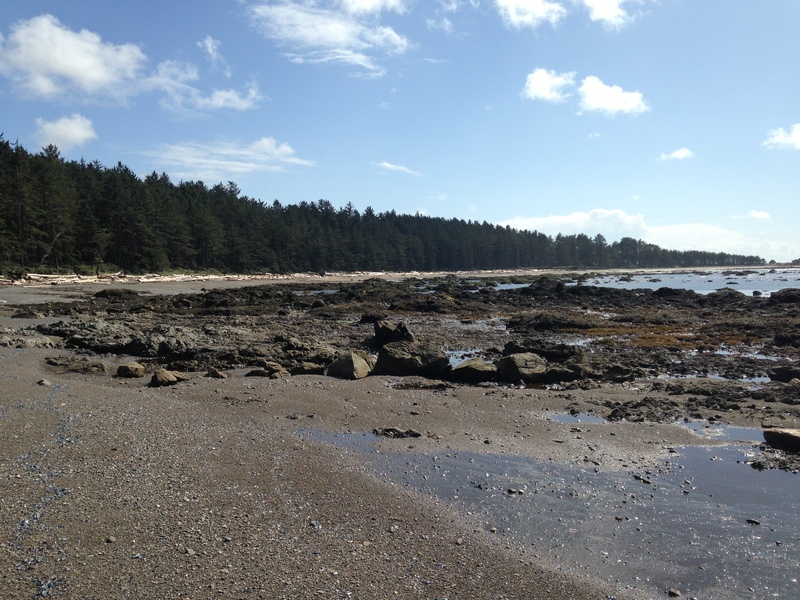 I recommend stopping at both Cape Alava and Sand Point to enjoy the views and explore coastline. Several small islands and sea stacks sit just offshore at both locations, and campsites are located at both areas as well. 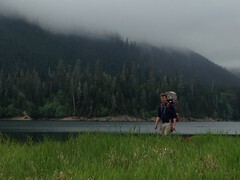 For more insight on what to visit in this part of Olympic NP, check out this article by The Oregonian’s Terry Richard. For more information on the Ozette Triangle hike, read this WTA description.